The Kallista Community Market is a country market with a range of handmade and home-cooked goods. Held on the 1st Saturday of each month (except January), you will find over 60 stalls at this large outdoor market. If it is handmade, home grown or home cooked, you will find it here. Each market has unique items which include jewellery, plants, soap, candles, clothing, knitted toys, woodwork, seedlings and skin care. You will also find heaps of delicious food here including fruit, vegetables, bread, honey, coffee, pizza, cakes, biscuits and poffertjes. There will also be live music from some local musicians and buskers and sometimes there is face painting for the kids. 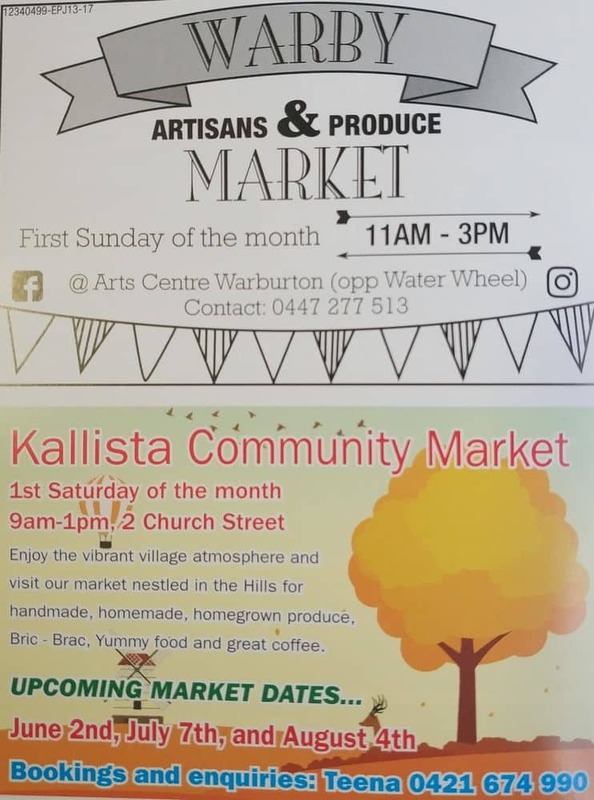 So come early and enjoy the community atmosphere at the Kallista Community Market. Dogs are welcome, but please ensure they are kept on a leash. Please also bring your own reusable bags to reduce plastic bag wastage. There is also plenty of car parking opposite the market and on the street.